According to Deadline, Netflix has acquired the GLOBAL rights to Shadowhunters! Netflix has acquired global rights, excluding the U.S., to Constantin Film’s The Shadowhunters: The Mortal Instruments. The streaming giant will premiere the title as an original series globally on Netflix a day after the U.S. broadcast on Freeform (fka ABC Family), with the first episode launching globally January 13. Subsequent episodes will release weekly thereafter. 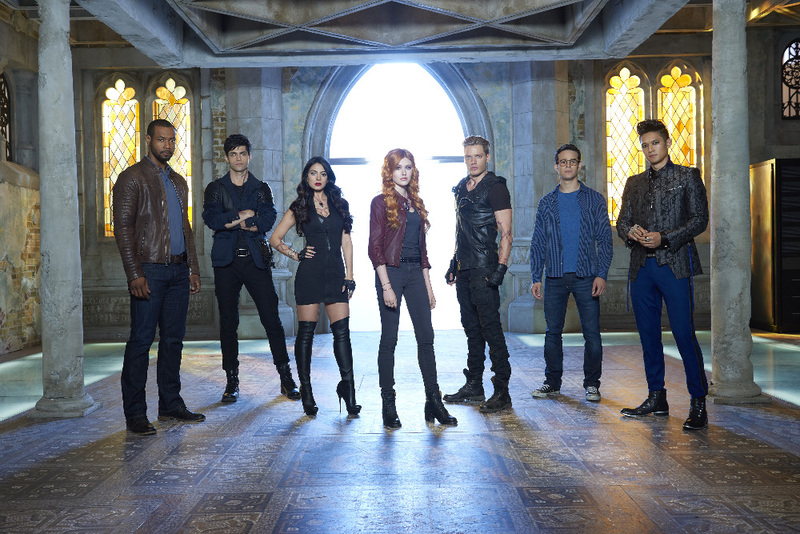 Shadowhunters is the TV adaptation spinoff of the bestselling book series The Mortal Instruments by Cassandra Clare. The book was previously the basis for the 2013 feature The Mortal Instruments: City Of Bones, directed by Harald Zwart and starring Lily Collins. The TV series follows Clary Fray (Katherine McNamara), who discovers on her 18th birthday that she comes from a long line of Shadowhunters – humans born with angelic blood who protect humanity from demons. When her mother Jocelyn is kidnapped by a powerful foe from her past, Clary is thrown into a new life of demon hunting under the guidance of charming and headstrong Shadowhunter Jace Wayland (Dominic Sherwood). Now living in the Shadow World among warlocks, vampires, werewolves and faeries, Clary begins a journey of self-discovery as she learns more about her past and what her future may hold. Kudos to Constantin Film for understanding that the love for Cassandra Clare’s The Mortal Instruments series is a world-wide phenomenon! How excited are you right now? Tell us in the comments below. Does this mean it will be on Netflix in the US after the entire series finishes airing right away? Netflix didn’t acquire the US rights but this could change. If you have Twitter you can ask McG or the official Shadowhunters account. Cool, so we still have a chance at getting to watch it commercial free! By the Angel! YYYYYYEEEEESSSSSSSS!! This makes me so happy! I’ve been panicking about how I’m going to watch it here in England. I was hoping they would pick it up as Netflix is the only place that shows Once Upon A Time and Pretty Little Liars over here and if I understand correctly, they’re all shown on the same channel in the US, so it makes sense for them to pick up Shadowhunters. Thank you, Netflix! Roll on January! Whoop, whoop!! OMG OMG OMG ASF#YFSLIUYFS I THOUGHT I WOULD HAVE TO WAIT FOREVEEER!!!!! Interesting that the name is different; “The Shadowhunters: The Mortal Instruments” They’ll fix that I guess. I was really rather upset seeing as the series was filmed in Toronto and we would not have been able to watch it….but now all is good!!! Can’t wait!!!! wait…so can people in the US watch it on Netflix after it airs on Jan12 or no? Netflix USA did not acquire the rights. Ask McG or the Shadowhunters twitter account. You do pay for the BBC, that’s what the TV licence is for in the UK. That’s why there’s no ad breaks on the BBC. so it will be on Netflix in Canada? YES ! Yes !! Me too I was so upset that we wouldn’t be able to see while the show is filmed in TORONTO and that MAXIM ROY is a well known actress in Quebec I CAN’T WAIT ! Do you know what time their adding it to Canadian netfix? BY THE ANGEL YESSSSSSSSSS! THANK RAZIEL. I was so worried that Australia wouldn’t get Shadowhunters. I’m counting the days!! GO SHADOWHUNTERS!! hurray! I was so afraid we wouldnt see the series in Canada! Does that mean that people in the USA can’t watch Shadowhunters on netflix? Netflix does not have the US rights so it looks like US fans cannot watch it – at least for now. Thank you Netflix!!!! This is going to be a great thing for the show!! As an Australian who was stressing on how I was going to watch this show I am so grateful!!! Yes!!!! I was so worried I wouldn’t be able to watch Shadowhunters!! Now I can. I am counting down the days until the 13th now. By the angel finally!!!!! Hopefully they’ll be close to the books. What time will it be added to Netflix? Would it be right away like after midnight? Netflix, except for Netflix USA, will add Shadowhunters at 12:01 am Los Angeles time. Netflix USA does not have the rights, but I think ABC Family/Freeform has an app where you can watch it. Ask our Twitter @tmi_source, I’m not in the US so I don’t know for sure. YOU CANNOT BELIEVE HOW EXCITED I AM RIGHT NOW! I CANT WAIT! what time will it be out on netflix in Ireland? Wait, it’s already January 13, and I don’t see it on Netflix. What the Heck? Where do you live? If you’re in the States then it will not be on Netflix since they don’t have the US rights.